Here's my All Saints "7 Curses" dress, with its intricate pattern of skulls, snakes, and other voodoo symbols. I just couldn't resist adding my Wendy Brandes swear rings and making it 8 Curses. During a meeting at work that day, I looked up from taking notes and noticed someone looking at my rings. An appreciative, laughing smile and knowing looks were exchanged; turns out there are some cool people in this place after all, at least cool enough to admire fantastic, cheeky jewelry. This dress is great for layering because its soft, sheer texture allows it to drape really well over a skirt. With this outfit I added a long-sleeved t-shirt for warmth, and the cape-jacket for shaping and to balance out the fullness of the skirt. The blend of subtle blue shades and neutrals is great for winter, but I'm also looking forward to how I can style this dress with brighter colors when the weather is warmer. Today I bring you my first-ever video post, featuring a couple of different scarf-tying methods that I've gotten questions about from time to time. For more methods, check out Sal's video tutorial; the ones I'm showing here are just the ones that I haven't seen described anywhere else (not that I've looked particularly hard). If you listen carefully at the beginning of the video, you can hear a siren outside and then the neighbor's dog howling at it. Ah, city living. I'm very excited about this sweater, which I picked up at Goodwill last weekend for $4.49. I'd been wanting a boyfriend-style slouchy cardigan, but somehow I just couldn't bring myself to pay new-clothes prices for an article of clothing that essentially looks like it's too big for me. So instead I thrifted this sweater which actually IS a couple sizes too big for me; it has the extra-long sleeves and the slightly baggy look I wanted, while still looking like it's designed for a woman's figure. Plus the cable pattern is just so pretty, and being 100% cotton the sweater is also extremely soft. Thrifting for trends is something that Sal has posted about quite a bit, but this was really the first time I've actively (as opposed to accidentally) done it myself. 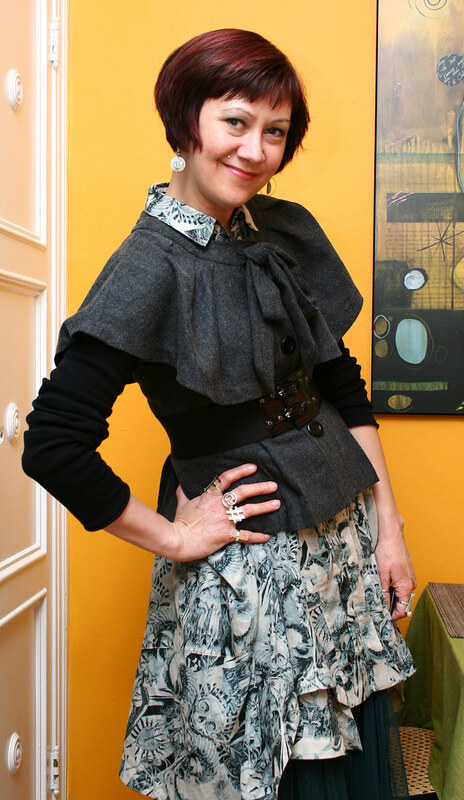 Check out Sal's advice on thrifting for trends here, and here. This outfit, with the teal and gray skirt combo, is the one I alluded to on Monday, and I was really happy with it when I walked out the door. By the end of the day though, I got the sneaking suspicion that I should've gone with a long silver necklace instead of the scarf, or else lost the hat. Something about the scarf combined with the long skirts, drapey cardigan, and turban-esque hat made me feel very gypsy fortune teller, which I'm not so sure is such a good thing. But boy, this outfit sure was comfy and warm, and who knows, maybe I could've made some easy cash reading palms in the cafeteria? It doesn't look like there's much to this outfit, but there are a lot of things going on here that make it just perfect for the cold, rainy weather we've been having lately. 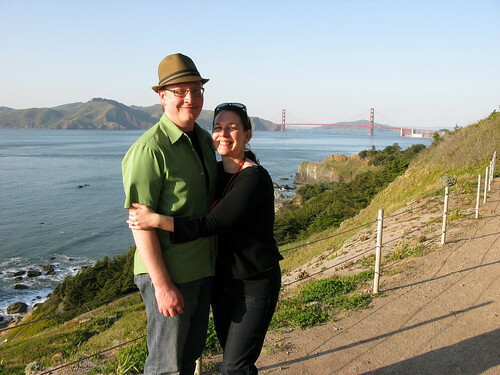 First off is the wool hat, which kept my hair from getting destroyed in the rain and kept my head warm at the same time. Next up is the angora-blend hoodie, which definitely added a lot of warmth and kept my arms covered. Finally, there are the multiple layers at work keeping my legs toasty: underneath are a pair of cotton leggings, over that are thigh-high argyle socks, and finally there are the boots to keep my legs dry. Long socks over leggings is a staple for me in the winter, because while the combination keeps my legs warm under skirts and dresses, it doesn't make the foot section too thick to fit in my shoes. This was especially important for these boots, which have absolutely no extra wiggle room. Here's another Girls' Night Out Sharks-watching outfit, this one from last week's game versus the Boston Bruins. The Sharks ended up losing in a shootout that night, but the game was still fun to watch, especially since Laura and I have now found our ideal viewing location. This outfit is made up of two skirts underneath the sweatshirt. 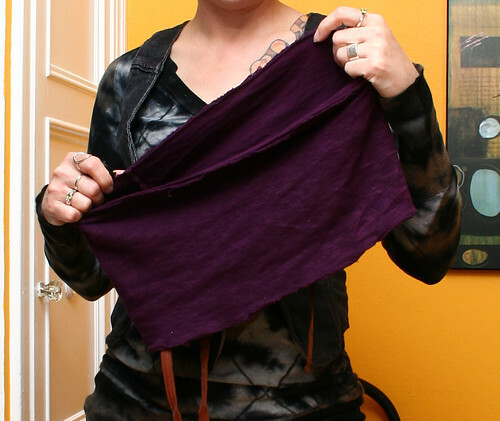 The gray skirt has a folded waistband that I simply unfolded and hiked up like a strapless dress; the sweatshirt kept the skirt from falling down. This had to be one of the comfiest outfits ever, since all the layers were stretchy and soft, with no constriction anywhere. I liked the combination of casual and dressier elements in this outfit, and I loved the feel of it so much that I decided to remix this skirt combo again for a work outfit, which I'll be posting in a couple of days. I've also worn this configuration before, in this outfit. Michi, please contact me either via my email (in my profile) or via the Etsy shop, and we can figure out what sort of hat I'll make for you. Thanks again to everyone who participated, and thanks for making blogging a fun and interactive experience! I bought this black dress, as well as an off-white version of the same one, from Gilt Fuse a couple of weeks ago. Between the credit I had in my account and the super low sale price, I got both dresses for $31 plus shipping. The thin, soft jersey fabric is just perfect for layering, and the asymmetrical ruffle is of course especially appealing to me. Initially I wanted the off-white version as an eventual replacement for my ecru dress from Lady Language, which is starting to pill and may not last too much longer, but the black version had so much potential with its subtle metallic gold stripes that I couldn't resist getting both. The thought of wearing this garment as a dress is laughable; between the ridiculously short length and the huge scoop neck, I'd be defying so many fashion rules that I'd probably be committing a felony in several states. Nope, for me it's a tunic, thanks. For this outfit I scrunched up the bottom to make it sit a bit higher; the jersey fabric of the skirt helped to hold the tunic in place. 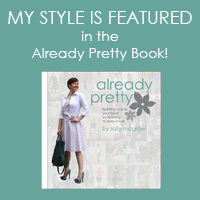 As you've probably already guessed, there is a deep mutual admiration and in-real-life friendship between myself and Already Pretty blogger Sal McGraw. So since Sal's birthday was just a few days ago, I thought I'd do something special and dedicate an entire post just to her. Can I make her blush? Will I get her to cry?? I promise I'll do my best! 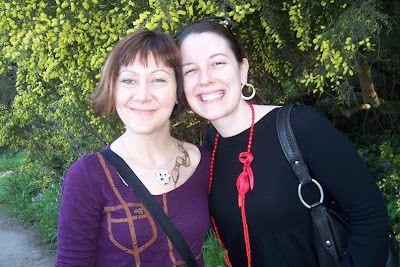 I first "met" Sal via blogging in the last half of 2008, and was thrilled to get to meet her in real life when she and her awesome husband Mike came to visit last April. I'm sure you won't be surprised when I tell you that they were wonderful house guests, and generously brought me not only a basket of fantastic Minnesota-themed goodies, but also a couple of Mike's beautiful photos. Mark and I had a lot of fun getting to know Sal and Mike, as well as helping Sal to rediscover San Francisco after her not-so-happy experience of living here several years ago. I'm still keeping my fingers crossed that one day they'll move out here and give it another shot, though Sal has steadfastly maintained that it isn't for her. In person, Sal is every bit as sweet and wonderful as you'd expect her to be. She's intelligent, loves great food, is one hell of a shopper, and despite having classic Gemini (ETA: whoops, that should have been Capricorn) over-planning tendencies, is actually very flexible and laid back (a great relief to my haphazard, spontaneous self!). And did I mention beautiful?? Sure, we all know how stylish Sal is, and what a great smile she has, but up close she has something else too: a serene, elegant beauty and grace. Hers is the sort of beauty that doesn't try too hard; she just radiates it naturally through her regal profile, cascading mane, and warm smile. Without a lick of makeup on, she has perfect porcelain skin and big, deep, thoughtful eyes. Sal also has truckloads of unaffected charm. She gets giddy at the sight of fabulous drag queens, squeaks with delight at accidentally sort of almost meeting Paul Smith, does a silly dance after finding a long sought-after pair of Fluevogs, and says adorable things like, "Holy cats!" and, "you can bet your sweet bippy." 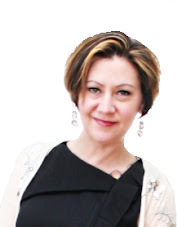 Of course her blog posts are informative, self esteem-boosting, and thoroughly researched, but they're also laced with offbeat humor, irreverent silliness, and plenty of personality. See how cute we are together? Clearly we were MEANT to live in the same town. This outfit features one of only two clothing items I bought down in Tulum during my Christmas holiday. I was a remarkably restrained shopper despite the abundance of really cute clothes in the shops; I think it was the fact that the heat made it not so fun to try things on. I found this asymmetric, layered halter dress in a shop called Shalom right on Tulum's main drag; it set me back about $75, which I thought was a great deal for such a unique piece. The dress is going to be perfect for the warmer months, but it works equally well layered up in this cozy winter look. Because the dress drapes fairly low in the front and is sleeveless, I added the scarf to fill in the neckline, and the purple cardigan to keep my arms warm. I selected the bulky scarf and drapey cardigan in order to give the whole outfit a relaxed, organic feel. Adding a belt gave some definition to my waist, although I matched the belt to the dress so as not to disrupt the long flowing line of the outfit too much. This outfit was pretty warm by itself, so for outerwear I wore my cropped black leather jacket to put an extra layer just over my arms. I thought I'd also include my handbag in the photo, since I went with the unexpected choice of my brown Lucky bag. I thought black would be too obvious, and a shade of brown with less red in it would've clashed. This bag is sort of cognac-colored though, so I thought it blended nicely with the warm purple and red tones while still adding an interesting color mix. By the way, as soon as I figure out how to enable the sound on my camera, I'll shoot a video tutorial about this method of tying a long scarf, as well as another method that I've gotten questions about. Hopefully I'll have that for you by next week. This style is one I call Equestrian Romantic; I used to wear stuff like this a lot more frequently, but lately I seem to be drawn to edgier looks. However, this style still continues to crop up in my wardrobe because it's feminine and somewhat classic. And I'll be honest; it's also pretty much a no-brainer to put together when it's 8:15 on a Monday morning and I didn't bother to put together an outfit the night before. Full skirts, fitted and belted cardigans, and low-heeled boots are a great combo that's both comfortable and warm. For other looks I've worn that have a similar vibe, check out this post, this one, this one, and reaching waaay back into the vaults there's this one. With this outfit I folded up the sleeves of the cardigan in order to expose the pretty lace-trimmed cuffs on the shirt. This also allowed me to push the sleeves up to my elbows if I wanted, which is something I tend to do with long-sleeved shirts. I'm off to enjoy the long weekend. I really appreciate having Martin Luther King Jr. Day off because it softens the blow of the long Christmas and New Year's holiday being over. I'll be back on Tuesday with a post on how to jazz up corporate wear in more conservative work environments. Have a great weekend everyone! All I can say to the overwhelming response to yesterday's post is WOW. It's great to see so many people commenting for the first time -- I mean, sure it's a contest and that's a motivator, but it opened up a nice opportunity to 'meet' some new folks and see what they have to say. The thing that's particularly exciting is what a diverse group we've got here -- readers from Brazil, Poland (and yes, I've been to Krakow -- I loved it! ), Belgium, and all over the US chimed in (as well as other places I'm probably missing because they weren't specifically called out), readers from different age groups, and several readers with polydactyl cats! Fantastic! I'll keep the dialogue going by turning to a different aspect of blogging and online lives in general, specifically with respect to how the increasing substitution of cyber for real interaction can result in further isolation and loneliness. This is an interesting aspect of the modern world we live in, because much of what the internet and social networking technologies supposedly provide is the ability to connect with people. But when you carefully tailor what part of you the online world sees, and if you carefully filter it so that only positive feedback enters your world, then what you're creating is an artificial community which bears no relation to the real world at all. Sure, a world in which people only see the very best side of you and have only positive things to say all the time is a tempting world to create. But here's the thing: unless you live in a cave in the middle of the Siberian wilderness, chances are that you interact with the flesh-and-blood world of humans pretty often, and in that world the naysayers and haters can't be edited out. The way we manage our online personas can either help or hinder us in dealing with differing views out there in the real world. 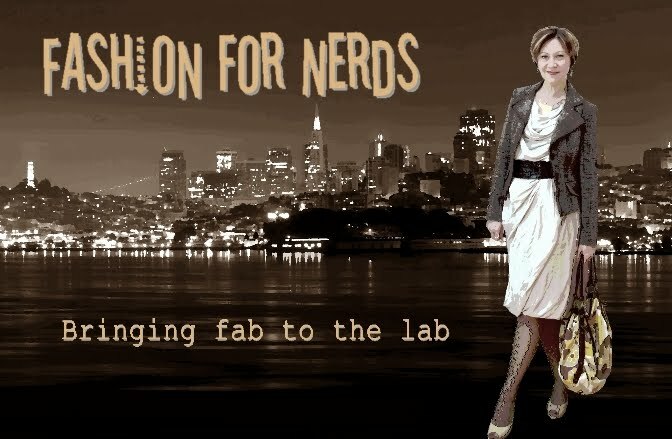 I'm 100% certain that people have, at some point, walked by me on the street or clicked onto this blog and thought, "Good lord, what the hell is she wearing?" I know it because I've occasionally thought the very same thing about other people as well; we all have. Tastes are different, and there's just no possible way to please everyone all the time. So whether you seal yourself off from negative feedback or not, the negative opinions are still there and always will be. The problem with living in a rose-tinted bubble in which everyone loves everything you do is that you're surrounded by people who don't know the first thing about you. So when these adoring fans are all telling you how wonderful you are, to whom are they really expressing that sentiment? Not the you who still gets pimples and has a tummy roll and the occasional hangover and is crabby before the first cup of coffee. Not the you who's had embarrassing corduroy experiences or liked bad heavy metal music in the 80's or sometimes puts together an outfit that fails miserably. But it's those very imperfections and foibles that allow our online selves to be more accessible, more 3-dimensional, and more real to the cyberworld at large, just as it's the honest, sometimes less-than-glowing opinions that the cyberworld may sometimes throw our way that allow us to build meaningful online interaction. And although there's no substitute for real life, face-to-face interaction, we can still build strong online communities by being as open and honest as we dare, and by inviting that honesty from those we interact with. Critique and dialog are important to our lives; without them we never really learn anything, nor do we feel that other people truly know us. For another perspective on this topic, I'd like to point you to an article that's been on my mind recently, called 7 Reasons the 21st Century is Making You Miserable, by Cracked.com editor David Wong. I've read David's stuff since he had his now-defunct Pointless Waste of Time blog, and while his writing occasionally veers into the realm of eye-rollingly juvenile, it is nevertheless thoroughly researched, intelligently written, and very often laugh-out-loud funny. His take on how living in an electronic age has lead to people having fewer meaningful relationships and a more negative world view is insightful and fascinating. By the way, if you'd like to weigh in on this and yesterday's topic but AREN'T interested in winning a hat (because hey, I know not everyone loves hats, and that's ok! ), then please leave your comments on this post. If you want to also be entered in the contest, then be sure to leave a comment on yesterday's post, or better yet, both! There's been a lot of interesting discussion swirling around in the blogosphere about a certain blogger who recently issued a mandate to readers about how and wherefore they may comment. I first caught wind of it, albeit a bit late because of my holiday break, over at Sal's blog, and was really impressed with Franca's excellent discussion over at Oranges and Apples. I'm not linking the original post because it annoyed me too much, but you can follow Sal's or Franca's links if you haven't seen it already. If you follow fashion blogs at all you probably already know to what I'm referring; the gist of it is that readers were instructed to only provide positive comments, a mandate to which many people, myself included, took exception. But as I've thought about it more, the thing that has risen to the surface as being the most irritating was the assertion that the blogger is happy with her style exactly the way it is and is not, "looking for pointers." Oh, really? So you're the world's foremost expert on style, and nothing that anyone has to offer could possibly be of any value to you? Huh. Rather than embarking on any sort of diatribe about the original post, because I think it's already been covered quite well, I'd rather share with you today my own philosophy of blogging and the comments that come from it. As always, I'd love to hear what you have to say about it. I started this blog without any sort of expectations other than having some fun with it and perhaps cataloging my outfits for future reference. The fact that it has continued to grow in readership and participation frankly floors me. Every day I eagerly log on to read all the wonderful feedback I get from my awesome readers, many of whom offer insightful commentary on what they like about my outfits, or what they'd try the next time around. It is from these comments that my style grows and evolves, and I'm always (I think) receptive to any sort of constructive criticism. Perhaps I'm overly optimistic, but my default assumption is that if someone takes the time to stop in and say that an element of my outfit is off, they do so with the best possible intentions, in the spirit of friendship and collaboration. I know myself that my outfits aren't always perfect, and frequently it's due to the limitations of my wardrobe. Often I have gone after a look that didn't quite succeed simply because I didn't have the right piece in my closet (yes, even my massive collection has holes!). Other times I'm pressed for time, I'm tired, or I'm not feeling particularly creative. Sometimes I'll scrap a look altogether, but more often than not I'll try it anyway on the hope that someone will offer me the solution that I just didn't see when I was putting it together. With any luck, the solution won't even have to involve me purchasing something new. I believe that the beauty of the blogging community is that it offers the opportunity for everyone to participate, and that's why I prefer it to fashion magazines or other mediums where the communication is largely one-way. I'm no fashion professional; I'm just a clothes horse with a day job, and I for one am open to all input as long as it's presented in a respectful way. Sure, if you drop by just to tell me I look like crap then I'll probably delete your comment (thankfully no one has ever done that! ), but if you want to offer me a suggestion that you feel would would improve my outfit, I'm all ears. 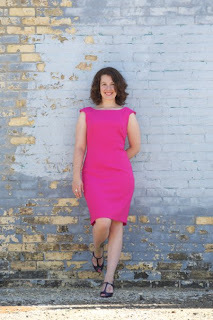 My main objective in writing this post is really to thank everyone who takes the time to stop in and comment, whether you love my outfit or think I really missed the boat. And just to prove how earnest I am, I'm going to offer you a special prize. All you have to do is leave a comment on this post sometime before midnight (PST) on Friday, January 22 and you'll be entered to win one of my handmade hats, custom designed just for you! Tell me your thoughts about this post or the one that started this discussion, tell me which of my outfits in the last month you liked the least and what I could've done better, ask me for style advice or tell me about your 5-toed cat; this is an open forum and you're invited to help make it a collaborative space for sharing ideas, stories, and advice, or simply for being fellow fashion enthusiasts and friends. 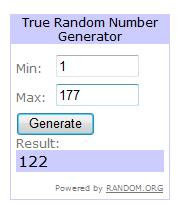 Drawing will be at random, and international entries are welcome. Good luck to everyone who enters, and a huge and heartfelt THANK YOU for participating! P.S. 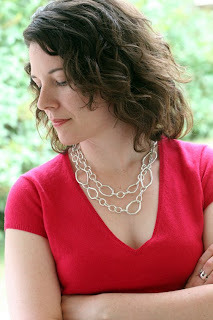 Beautiful blogger Eyeliah from Style Symmetry has interviewed me for her Symmetry Seven feature! Check it out! I thought today I'd do something a bit different by spotlighting someone who's been hugely influential for me: the incomparable Björk Guðmundsdóttir. Though I wouldn't say I've ever actively tried to dress like Björk, she nevertheless has influenced my style tremendously because of her admirable penchant for taking risks. Though her infamous Oscars swan dress is widely acknowledged as a major fashion faux pas, I totally, totally got it. Sometimes it's not about dressing to fit in with a particular audience or even wearing what's considered to be flattering; sometimes it's just about doing something that brings you joy. And in many ways I think it was also Björk's acknowledgement that she really does not belong to the glamorous Hollywood world; she's an avant garde, musical innovator, and as such she's an outsider at the Oscars or any other celebrity function. I for one applauded her ability to celebrate the cheeky and ridiculous; what a refreshing change she is from artists, and people in general, who take themselves way too seriously. Clearly it was also Björk who put Iceland on the map for me. I remember first hearing that the Sugarcubes were from there and thinking, "Whoa, people actually live in Iceland?" (remember, I was only 19). It wouldn't be until many years later that I would randomly come across a travel article about Iceland and, because of its connection with Björk, stop to read it. From that point on I was determined to go, and as of this writing I've been to Iceland 6 times and counting. Though I'd always loved Björk's music before, it really wasn't until I'd gone to Iceland, walked on the spongy moss-covered lava, examined the intricate and tiny plant life, listened to groaning glacial ice and seen bubbling mud pits and sulfur-spewing fumaroles, that I truly felt as though I was beginning to grasp it. Björk has a flair for the minuscule, unexpected elements that are clearly influenced by her otherworldly land. Tiny, tinkling bells, whispering voices, and other ethereal sounds are all exactly the kinds of things you hear in the windy, desolate reaches of the Icelandic landscape. I remember an interview where she said of one of her albums (I believe it was Vespertine) that you almost need a microscope to listen to it, which is such a perfect way to put it. I may not always love, or even quite understand, Björk's stylistic or musical choices; frankly, I find some of it too obtuse and inaccessible be either wearable or listenable out here in the real world. Much of what she does she can pull off simply because she's Björk, and I've learned to accept the fact that there are some things in life that you simply don't question. I'll always admire her unique talent and capacity for the bizarre; she has a childlike, mischievous quality as well as an almost futuristic wisdom, as if she's too far ahead of the rest of us to be truly appreciated now. No matter what she does, love it or hate it, it's almost certain to be interesting, and for that she continues to be an influence for me. Who are your style icons? 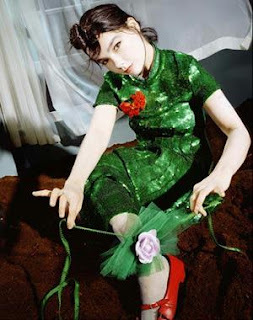 How do you feel about people like Björk, who push the stylistic boundaries? And finally, would you like to see further Style Icons features on the blog? 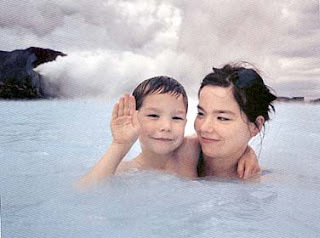 Björk with her son Sindri at Iceland's Blue Lagoon. Let's all say it together now: awwwww!